Chapter 8, the final chapter of Receiving the Day, ends with a description of a funeral. It is appropriate that Bass would conclude her book about time with this inescapable truth: at some point, we all run out of time. In her discussion of Psalm 90, traditionally understood as “a prayer of Moses,” Bass describes how these verses “bring together two kinds of time–our short sigh and God’s mountainous eternity–together” (121). Our lives are so miniscule compared with the vast perspective of God; yet somehow, each of our tiny little lives is sacred and full and unique. For me, being a person of faith revolves around this beautiful paradox: that human life is both infinitesimal and epic at the exact same time. I find something weirdly comforting about this idea–it suggests that there is a limit to human suffering. This can help when we’re in the thick of our pain; it might encourage us to imagine an horizon with something else, something good, beyond it. As our Sabbath study comes to a close, Isaac’s image of time as “an ever rolling stream” is useful too. 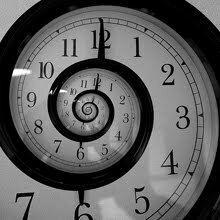 Time isn’t divided into perfect, discrete sections, but instead moves like a body of water, a flurry of connected molecules. With summer ending, I imagine we’ll all soon pick up on a quickening in the air. New fall season, new school year, new projects at work and home, new worries, new hopes… it’s exciting and stressful. But your Sabbath experiences are not locked in the past. Instead, imagine you’re carrying them with you in the stream; you are soaked in them.